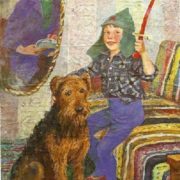 Soviet artist Kapitolina Rumyantseva was born December 16, 1925 in Leningrad, the USSR. 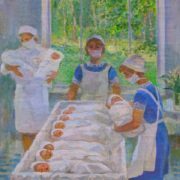 In 1945-1950 she studied at the Leningrad artistic and pedagogical school, workshops of G. Shakh, D. Ryazanskaya, V. Petrova, and M.Shuvaev. 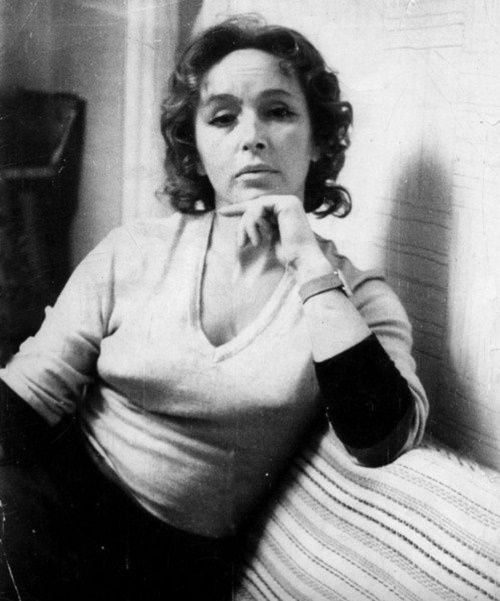 After graduation, in 1950-1969 she taught art in schools of Moscow and Vasileostrovsky districts of Leningrad. 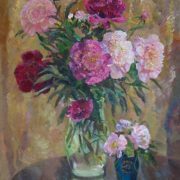 Since 1969, she worked as an artist of easel and monumental painting in the workshop of pictorial and decorative arts. 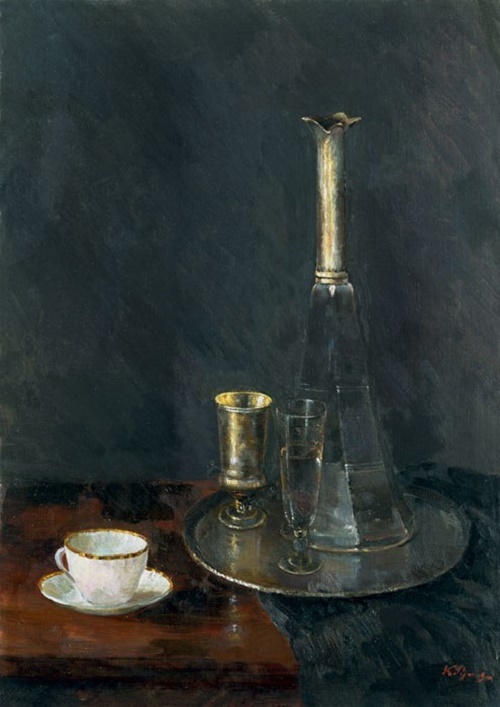 Simultaneously, since the beginning of the 1950s she worked creatively, and mostly in the genre of landscape and still life. Since 1970 Kapitolina Rumyantseva participated in exhibitions. In 1973 she became a member of the Leningrad branch of the USSR Union of Artists. 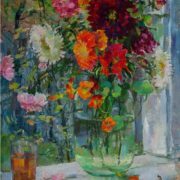 The greatest fame and recognition Kapitolina Rumyantseva got for her still lifes of flowers and fruit. Her painting style developed in the direction of strengthening the decoration and color while maintaining the locality of interest in the subject, the transfer of its texture and material tangibility. Created images consistently filled with lyricism and poetic sound. 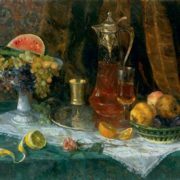 Kapitolina Rumyantseva is the author of such paintings as “Still Life with Fruit” (1965), “Still life with melon” (1968), “Still Life with a white cup” (1969), “Iris” (1970), “Still Life with Orange,” “Peonies” (1971) “Dream”, “elder” (both 1972), “Still Life with apple branches” (1973), “In the garden in early spring”, “Cloudy day”, “Still life with fish” (all 1974), (1975), “After rain “(1980),” Autumn in Ozerki “(1985),” Autumn “(1987),” Peonies” (1990), “Lilac” (1991) and others. 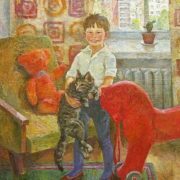 Soviet artist Kapitolina Alekseyevna Rumyantseva died August 8, 2002 in Saint-Petersburg. Her works are in museums and private collections in Russia, France, USA, Norway, Belgium, Italy and other countries.